How is Australian management really performing? There’s a lot of good reasons to do a 360 performance review. One of the most critical is to make sure you’re getting an accurate picture of the real situation (and not just one person’s view). It’s common sense that any performance review that’s only based on one viewpoint has the potential to go badly wrong. (if you’re interested, we touch on the other reasons you should be using 360 reviews in our detailed guide to 360 performance reviews). When you ask middle managers how they are performing, only 27% think middle management is underperforming. However, when you ask senior managers, 64% rate the skills of middle management as “below average”. This finding got us interested about whether there was such disagreement about the broader performance of Australian management. A broader look at the performance of Australian management. To get a 360 view of Australian management, we went looking for data from the top, the middle and the front line. One of the best resources we found comes from the Australian Institute of Management (AIM). AIM have been publishing an annual management capability index since 2012. To compile this capability index, AIM asks managers from 420 different companies to rate their organisation’s management performance (“how well is the organisation performing vs. the capability of management”). To get a comprehensive review, we’ve integrated this data with Glassdoor for front-line employees. There’s more detail on the methodology and logic below. The view from the top: The CEO perspective on Australian management. AIM’s Management Capability Index (AMCI for short) shows that the average CEO thinks their organisation is operating at 72% of management potential. This is a concerning figure from the leader of the organisation (who is ultimately responsible for the performance of management). On average, CEOs are saying that their management team is leaving nearly 30% of potential performance on the table! It’s a major performance gap! If you have some time (and you’re a HR nerd like me), the underlying data makes for fascinating reading. It reveals that CEOs think that Australian management are worst at “Results and Comparative Performance” (68%) with “Visionary and Strategic Leadership” also performing poorly at just under 70%. The view from the middle: What do senior managers and middle managers think about Australian management? 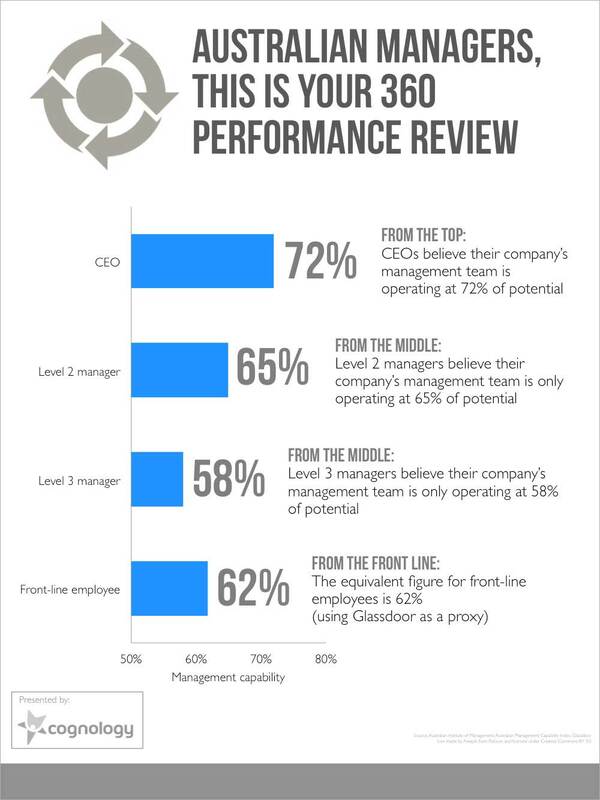 Ratings of management performance continue to fall as we move down the hierarchy. The AMCI shows that Level 2 and 3 managers feel their organisations are only operating at 65% and 58% of management potential respectively. These ratings are a strong criticism of overall management performance. In plain English, level three managers are saying that they think their company’s management team are capable of performing at almost twice current output! Level 2 managers are particularly critical of management performance on “Organisational Capability” (57%) and “Innovation” (just under 60%). Level 3 managers are significantly more critical of management performance on “People Leadership” (just 50%) and “Application of Technology” (again 50%). The view from the frontline: Employees’ thoughts on Australian management via Glassdoor. The thoughts of employees are not far removed from the management capability index. We’re using Glassdoor as a proxy for how front-line employees think management is performing. On Glassdoor, employees are asked to give the company and management a rating out of five. For the ASX 100, the average rating is 3.09 out of 5. On a percentage basis, that converts to just under 62%. For comparison, 62% sits comfortably between level 2 and level 3 managers. Everyone agrees that there’s a massive gap between Australian management’s potential and what’s actually being achieved right now. This is a major national problem and productivity issue. CEOs think that management is doing better than anyone else in the organisation. It appears that there’s a real communications failure from Australian CEOs in making sure the rest of the organisation shares their (relative) optimism around the current performance of the organisation and management team. Middle managers are a major problem area for Australian organisations (whichever way we look at it, as we showed in this previous article). The data here shows that middle management is increasingly jaded about the broader performance of management and leadership. And finally, an interesting takeaway with much broader implications: Glassdoor looks to be a surprisingly good proxy for management capability. How do these results stack up with your management experience? Any key takeaways that you think I’ve missed from the data? Jump on the comments or reach me at @cognology on Twitter. What does a crisis in MIDDLE management mean for TALENT management? Middle managers have it tough. They’re facing an environment with increasing workloads and constrained resources. The Australian Institute of Management (AIM) understands the challenges. They recently released a discussion paper called Engaging Middle Managers For Positive Organisational Change. 89.3% of senior managers agree that middle managers are the linchpin to effectively communicate the needs of senior management to their teams. 92.7% of senior managers agree empowering middle managers is key to effective implementation of organizational change. For the majority of Australian executives, there’s no doubt about the critical role of middle management for communication and driving organizational change. 64% of senior managers rate the skills of middle management as “below average”. However, only 27% of middle managers think middle management is underperforming. You don’t need to be a talent management expert to understand the issue here! Middle managers are failing to meet the expectations of senior management, and they don’t even know it. Talent and performance management done well is all about making sure that everyone’s on the same page. Everyone knows whether they’re on track and what success means. From this data, it’s evident that there’s a major expectation gap. Middle management and senior management clearly have very different ideas about what is expected from middle management. Understanding the expectation gap: Middle managers think they need more soft skills, everyone else thinks otherwise. These charts make the expectation gap very clear. Middle managers are focusing on soft skills, and that’s reflected in how they are perceived by both managers and their direct reports. Middle management are being evaluated on the competencies that senior management and their reports think they SHOULD have. Middle management are evaluating their own performance based on the competencies that they think they SHOULD have. But because these competencies are unclear, there’s a major gap between perceived and actual performance. The aim of great talent management is always to minimise the expectation gap. If you’re doing performance management well you should never have the scenario where an employee thinks they’ve done great work, only to be told otherwise in a 6 monthly review. Everyone from direct reports to the C-suite should read AIM’s discussion paper, it articulates why it’s so critical to set clear expectations and objectives for everyone in the organization. Everyone benefits when the scoreboard is visible and plain to see. Have you read the discussion paper yet? Have anything you’d like to add? You can reach me on Twitter @cognology or jump on the comments below. https://www.cognology.com.au/wp-content/uploads/2015/01/Middle-managers-crisis.gif 210 210 Jon Windust https://www.cognology.com.au/wp-content/uploads/2017/01/Cognology-logo-colour-300x101.png Jon Windust2015-01-12 04:11:392018-08-27 11:08:04What does a crisis in MIDDLE management mean for TALENT management?